Introducing our exclusive Innocence Moods luxury fragranced candle, whose medley of intense floral notes helps to capture the romance, femininity and joy of the colour pink. We've combined rose with the scents of patchouli and bergamot to recreate that elusive sense of childlike innocence, which will enliven your home with a captivating and beloved fragrance blend. Exclusively available as part of our Mood Colour Therapy collection - a range of scents inspired by the power and mood-lifting properties of colour - this pink fragranced candle comprises a fusion of geranium, rose, patchouli and bergamot, which together help to exude the spirit and playfulness of the colour pink. What does the colour pink mean to you? To us, it represents the essence of love, romance and tenderness, while also exuding subtle femininity and sweetness. Pink inspires us to love ourselves and one another, and that's a feeling that our skilled perfumers have sought to capture in this unique Mood Colour Therapy luxury fragranced candle. The wax itself is fragranced with the iconic scent of rose, which is the universal scent of romance. This is complemented beautifully by fragrant geranium, while patchouli delivers a rich and powerful base note, and the summery freshness of bergamot which allows the lighter floral bouquet of rose and geranium to really sing. Encased in an attractive pink smoked glass votive, this wonderful candle delivers up to 60 hours of powerful, long-lasting fragrance, and has three wicks to ensure a clean and consistent burn. 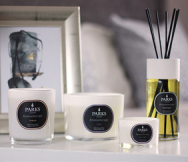 Packaged and delivered in a fabulous presentation gift box, the Moods By Parks candle is the ideal gift for that special someone.